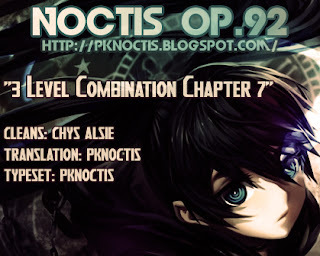 So...I took my week-long break, and here I am with our next project "3 Level Combination" (picked up from Webtoon Live) My girlfriend also made me this new logo thing + credits page...what do you think? I'm also STRUGGLING to bring Aphorism releases, but there's a problem with the Chinese raws. Recruiting Chinese translators anyways...!! you're welcome! hopefully we can steadily release. stay posted, and thanks for commenting. thanks suzumi (on behalf of my gf) haha. Woo thanks for picking this up! I shall bookmark your blog now .. I hope you enjoyed your dinner...thanks for commenting! Ah, I thought no one would pick this up! Thanks for the treat! Hey! Glad to see you considered my suggestion! Great work as always, such a good chapter! Also, thanks for publishing the Korean and Japanese grammar posts! It's really fun to learn about these things that I wouldn't normally be exposed to. Ahaha thanks back to you from my girlfriend.